This year's #The100DayProject begins on Tuesday, April 3rd - are you joining in? The idea of the project is that you pick a creative action, do it every day for a hundred days, and share your progress on Instagram (or elsewhere online) via the main project hashtag and using a unique hashtag for your own project to collect all your pics together. 100 doodles! 100 portraits of cats! 100 photos of flowers! 100 embroidery stitches! 100 paintings of Brutalist architecture! 100 days of potato printing! Small or large, quick or time-consuming, relaxing or challenging, you choose what works for you. Last year I decided (on a whim and very much at the last minute) to join in for the first time with #100DaysofFeltStuff... and lasted less than a fortnight. It was an amazing thing to be part of, though. I connected with so many awesome makers, learned some really important lessons about my perfectionist tendencies (frustrated tears were shed!) and the pieces I stitched ended up being some of my favourite work that year. So, I'm trying again this year with the slightly more focused #100DaysofFeltFood. 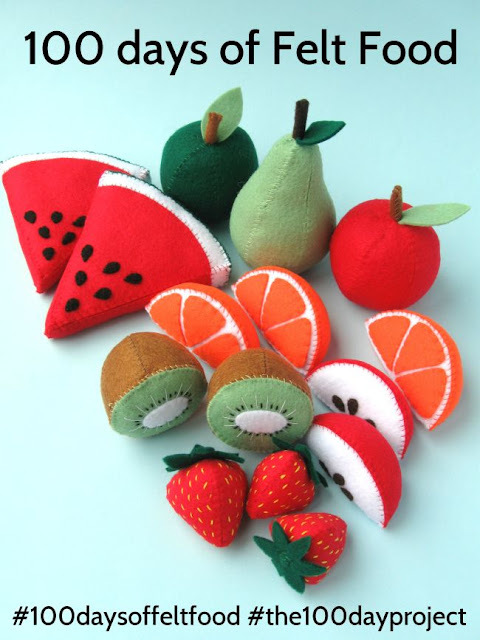 I've had fun making felt food in the past (including these felt fruit tutorials and last year's felt Jaffa Cake), and I feel like this topic will give me lots of variety without hitting that "oh gosh I could make anything but what???" panic which I suffered quite a bit of last year. I'm hoping with a bit of planning, I can flex my creative muscles without tearing my hair out and make it all the way through the 100 days this time. Fingers crossed! I'll be sharing daily photos on my Instagram Stories, and posting updates in my main Instagram feed - as well as on Facebook, Twitter and here on my blog. So if you're keen to see what I'm making but don't use Instagram don't worry, you won't be out of the loop. UPDATE: It looks like the direct links to my hashtagged 100 Day Project pictures aren't working if you're not logged into Instagram, which is rather annoying. If you don't have an Instagram account you'll still be able to follow along with my new project by browsing my main feed here, and you can see most of my designs from last year here. bairozan - as a regular reader of my blog you'll know I have often started big projects but not ended up finishing them, but I think it's fun to try all the same :) I think the key is to do something you're really interested in and keep it manageable, then if all else fails to not feel bad if life gets in the way of you finishing the project - lots of the people I follow on Instagram only got part-way through their 100 days last year (or are still working on them slowly as a long-term creative challenge), but it's still really fun being part of a creative community trying new things.